Orange County Animal Services has now entered its 50th year in operation. Animal sheltering has drastically evolved since that time, when initially the sole mission was to round up and house stray animals. Animal Services has made several progressive changes to benefit the animal community in the recent decade and the addition of the obedience training class is another the shelter believes will result in substantial change. The new four-week course is designed to provide quick results in the participating dogs and teach lasting training techniques for the handlers, focusing on commands, motivation, leash handling and consistency. The overall goal for the program is simple, to foster a positive and trusting relationship between the dog and new pet parent. By establishing this bond early, the shelter aims to position the pet as a lifelong family member, reducing any risk of return for behavior reasons. The program just celebrated its first graduates. 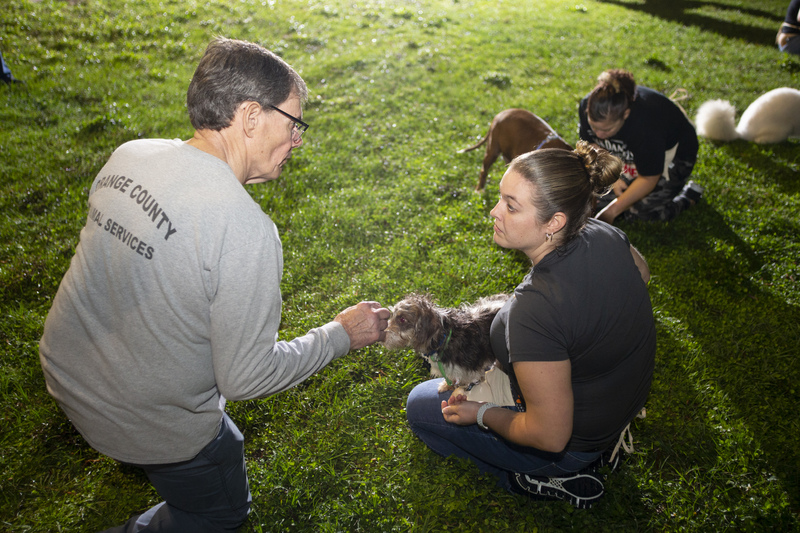 For the past four Wednesday evenings these dedicated owners and their newly adopted companions met the Animal Services training team at “Oreo Field,” the grassy area adjacent to the shelter affectionately named for a long-time resident. The training team is comprised of skilled and experienced volunteers who spent the weeks prior to the program’s launch learning training maneuvers from Luther, who has acquired nearly 45 years of dog training knowledge. For more information about adoptions and to enroll in the next training program, visit Animal Services online by following www.ocnetpets.com You might just find a friend waiting for you. Photo Caption: Orange County Animal Services Manager Dil Luther provides advice to a new pet owner at a recent dog obedience training class.